This past weekend we took some time to explore more of the country and went on a safari to Murchison Falls National Park. It was refreshing to escape the congestion of Kampala and head out into open land. It was like being in a different country once we left the city – sprawling plantations, forests, and a night sky filled with countless stars. One of the largest national parks in Uganda, Murchison is said to be the best place to go for your first safari because of the variety of wildlife and topography. I would definitely agree with that statement. I was first surprised by the size of the park. After we officially entered the park, we drove for at least another hour to get to the waterfalls, and then another hour after that to get to our campsite. 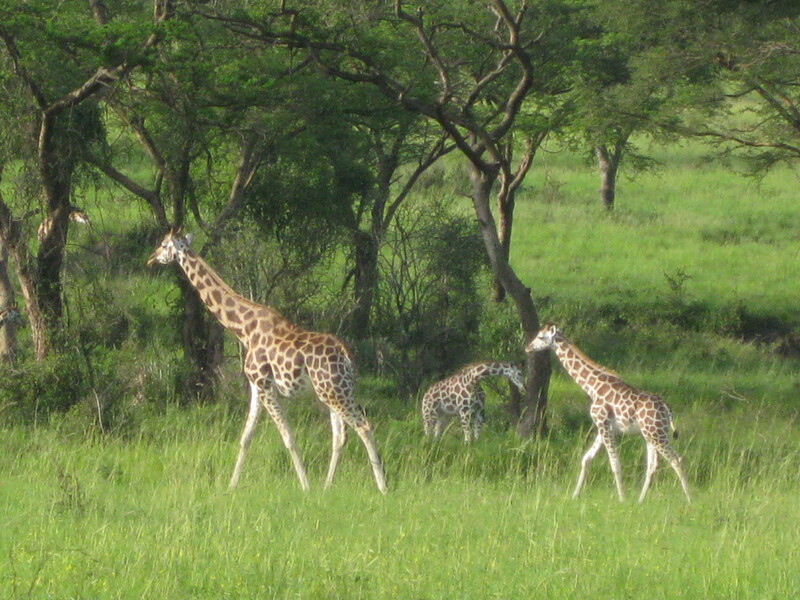 But it wasn’t until we went on our game drive early the next morning that I could really see how expansive the park is. Standing in the van with the top popped up, watching the miles and miles of savannah rush by as we searched for game, was exhilarating. I could literally see the land stretch all the way to the horizon, but sadly my camera could never sufficiently capture such a sight. I guess that makes the moment even more special. We saw a ton of animals, my favorite being the giraffes. The babies looked so fragile, wobbling on their skinny little legs! Then there were the herds of elephants, cape buffalo, bush buck, hippos, baboons, and even warthogs. Warthogs were actually frequent residents of the camp, and if you didn’t remove all food from your tent, you were sure to have a visitor at night. Apparently, hippos regularly graze around camp at night as well since the campsite is on the banks of the Nile, but we were lucky enough to avoid any hippo encounters. As the Nile River is a big part of the park, it wouldn’t be a complete safari without a boat ride on that majestic body of water. 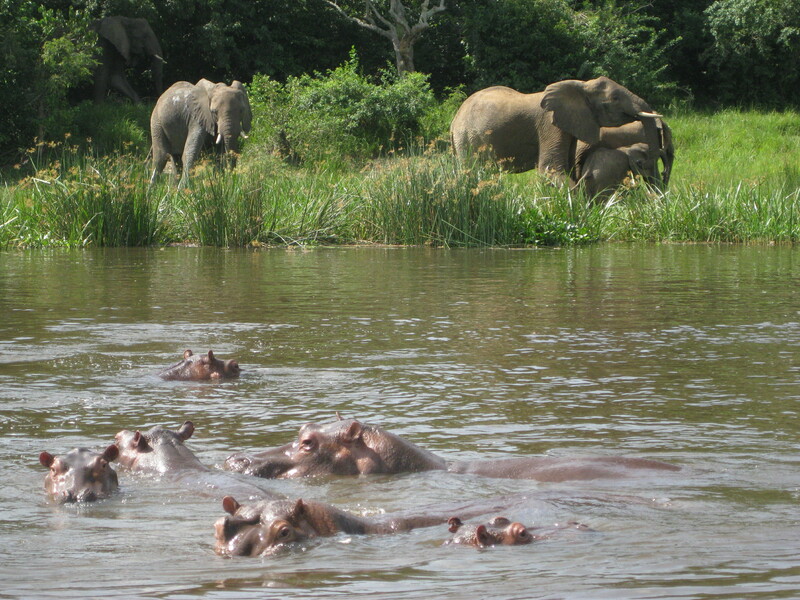 Everywhere we looked there were hippo heads emerging from the river, snorting streams of water into the air. 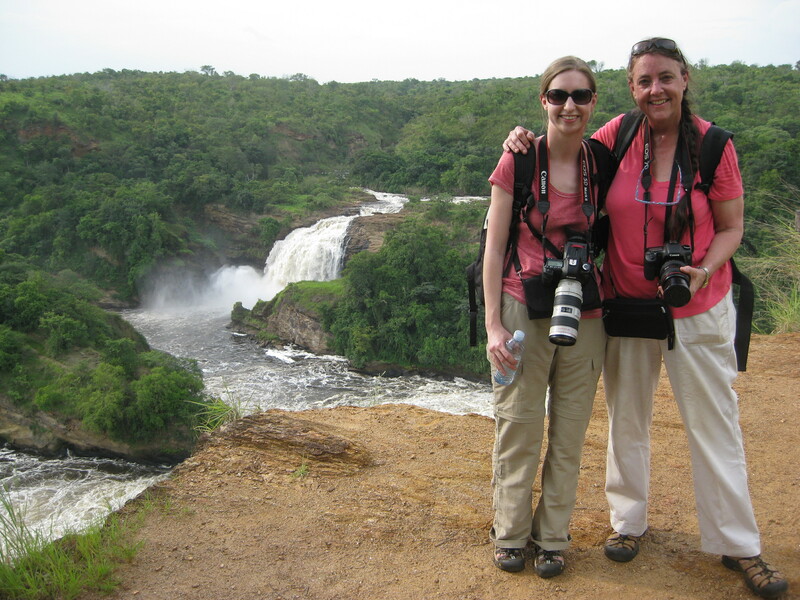 We took the boat to Murchison Falls themselves, two waterfalls that are some of the most powerful in the world (with the entire Nile River rushing through two small crevices, you can imagine that the force of the water would be rather intense). Drifting down the Nile at sunset was a perfect ending to an adventurous day. Since we were on a “Big Five” safari (“Big Five” referring to elephants, lions, buffalo, leopards, and rhinos), we made a stop on the way back to Kampala at the Ziwa Rhino Sanctuary. Rhinos are sadly extremely endangered – they had already been poached to extinction in Uganda in the 1980s and a few had to be imported in order to restore the population. Because they are still being hunted for their horns, there are guards that constantly follow the rhinos around, protecting them from poachers at all times. 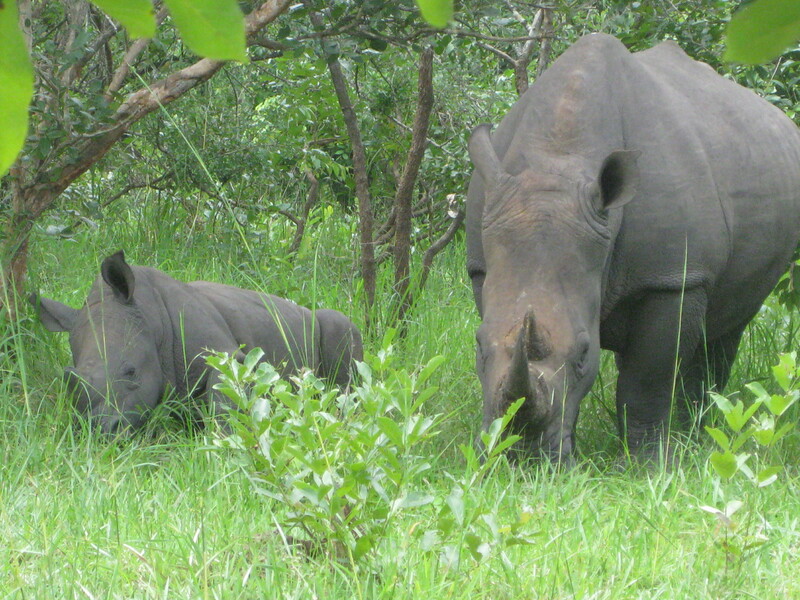 There are currently only NINE rhinos in Uganda, and after trekking through the bush, we got to see two of them. They are magnificent creatures and it’s a shame that people still want to hunt them down. Our other journey on the Nile was on Monday, when we traveled to Jinja. Jinja is the source of the Nile, so I can now say I’ve been to both the source and the end of the Nile River (in Egypt). We went rafting in the morning and relaxed on the bank in the afternoon, reflecting on our time in Africa. We’re currently en route to Istanbul, Turkey, and I must say I am sad to leave this beautiful country. I’m so glad that we got to spend time with Letha and see things from an insider’s perspective. I’ve learned a lot about the politics of world aid, the recent history of Uganda and East Africa, the Ugandan culture, and especially the meaning of T.I.A. (This Is Africa). It’s opened my eyes to life in Uganda and Africa in general, and sparked my interest in exploring more of the continent – I definitely plan on returning to the region! This entry was posted in People Making a Difference, Travel and tagged adventure, Africa, animals, around the world, camping, discovery, excitement fear, exploration, national park, Nile, People Making a Difference, rafting, river, round the world travel, safari, traveling abroad, Uganda. Bookmark the permalink. Thank you ladies form showing us your safari. The animals were beautiful! Also terrific to hear about your experiences In Turkey so far!